We went out until about 4:30AM our first night and ate breakfast at about noon. 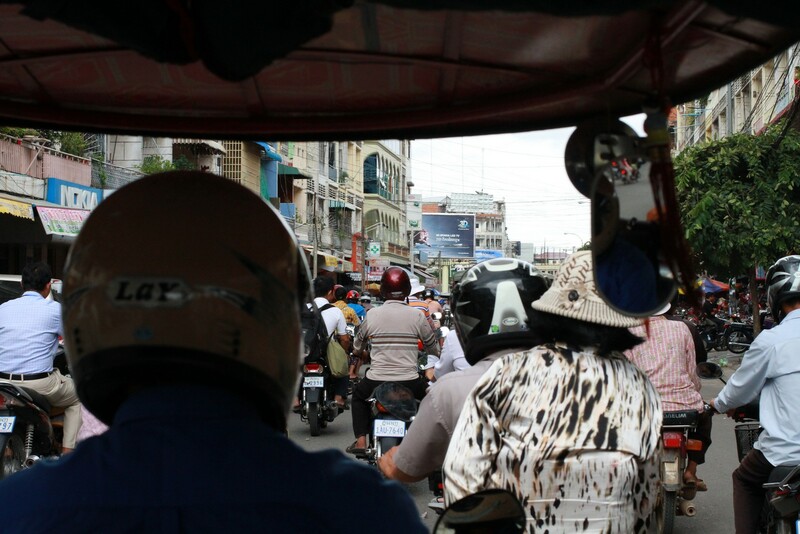 Erika and I met up with Shane and Arielle again for some fun and food in Phnom Penh with the goal of reaching Kep or Kampot to unwind and have some crab. But mostly just for crab, green pepper crab. Apart from being a bit bleary eyed we were looking forward to the day. Sunny (Sunn Ny), our taxi driver from the other day found us right away and after some quick negotiating (he’s a realist), we were off to a shooting range. We heard rumors, stories, and thought why not give it a try and shoot big guns you couldn’t shoot back home. Erika and I have lived in Idaho and Arizona, and had the opportunity to shoot all sorts of big hunting and hand guns, but neither of us has a big comfort level with them, even if we hold them with confidence. But wait, there’s more! We have gone from one lovely country to another. Although instead of the quiet calm that the Laos people exhibit, Cambodians are incredibly friendly and engaging. Granted Siem Reap is a bit of Disneyland for adults, but mostly because the infrastructure is so developed and the city well manicured thanks to the tourism dollars. Still it was nice to see Cambodians also visiting and taking pride in their great temples. Maybe we’ll encounter something different in Phenom Penh tomorrow. For now, we enjoyed a lovely 3 days here, $1 street food, beautiful temples at Angkor (more coming soon! ), and country, despite its haunting recent history, recovering well.